Rail Analysis India : Please share your experience with us on working for Kolkata East-West metro project and What are the type of challenges being faced in the construction of the project ? Mr. Debasish Dey : The challenges faced in the construction of the project has been as follows. The experience has been captured, as explained by the Tunnel Execution and Design Team. Owing to its urban location, the geometrical alignment of tunnel comprised of numerous structures/buildings/bridges within its influence zone. Often the geometrical alignment passes directly beneath or in close proximity to the structure(s) where the tunneling operation had to face and also yet to face numerous challenges which is as detailed below. Colvin Court Complex is an Eastern Railway Residential Building Complex immediately after leaving the Howrah Maidan Station. The alignment has been proposed underneath part of Main Building & an External Stair Case, the age of the building being more than 100 years. The building being resided by Railway Official, the rehabilitation of the residents of the apartments within the influence zone of the tunnel, prior to tunneling operation and keeping the structure safe was the greatest challenge. Bankim Sethu located across Howrah Station Yard is having a total length of approximately 840m. The alignment has been proposed underneath the Bankim Sethu between Old and New platform of Howrah station. old ROB intact. The East Bound Tunnel proposed within 2.5m of the bridge substructure which required minute precision during tunneling. Based on the visual inspection, cracks on the crash barriers (Railing), Vegetation growth at different location & Spalling of concrete which were led to exposed rebar, were detected. Further deterioration of the structure was detected due to several factors like poor maintenance, Recent Earth Quakes & corrosion of reinforcement. DRM Building is the Office Building of the Divisional Railway Manager of Howrah Station under Eastern Railway. The alignment has been proposed exactly underneath this 105 year old building. Tunneling below DRM Building without interruption of the building activities. Howrah Station operation being completely controlled from DRM Building which includes all the engineering and administrative departments. The Building Condition Survey report highlighted that the general maintenance of the building was poor. Growth of Vegetation, Damp Patches, Spalled off Plaster and Concrete Saplings, Cracks and Fungal Growth were conspicuous at various locations in and around the building. Brabourne Road Fly Over is one of the busiest fly over that connects Howrah to Central and south Kolkata. 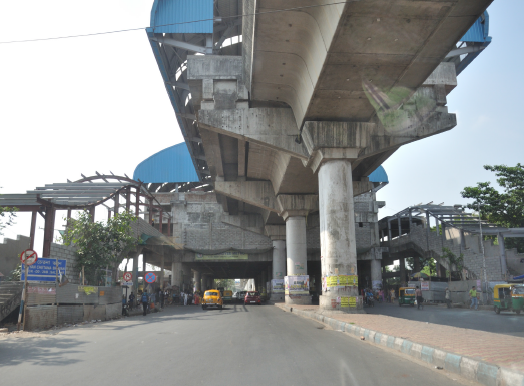 This 1.2 km long flyover carries over 5 lakhs vehicles per day at the close proximity of the CBD of Kolkata. The alignment has been proposed underneath this flyover. Severe corrosion on metallic sheet cover and support of deck slab observed. Vertical, Horizontal and Diagonal crack found near expansion joints. As Brabourne Road Fly Over, being the nodal point, connecting Howrah and Central & South Kolkata, a huge volume of traffic uses that flyover every day. Based upon the condition of Structure and anticipating the behavior of ground movements and subsequent degree of impact assessed on the current condition of structure, complete closure of the flyover was proposed during tunneling operation. The alignment has been proposed within the restricted zone of Archaeological Survey of India (ASI)’s listed monuments, namely Beth El Synagouge, Maghen David Synagouge and Currency Building. Necessary preemptive measures has been taken for the controlled construction of the tunnel and UG station. The Heritage Buildings under Kolkata Municipal Corporation namely Writers Building, St. Andrews Church are also falls along the proposed alignment. The challenge includes tunneling at very close proximity of these important Heritage Buildings. Rail Analysis India : What is the current status of the Kolkata East-West metro project and When is the tunneling and other works for entire network scheduled to be completed ? Mr. Debasish Dey : Kolkata Metro Rail Corporation (KMRCL) has planned to start operation of the first phase of the project between Phoolbagan and Bidhannagar by October 2018. The operational date for the second phase of the project connecting Howrah and Kolkata has not yet been announced by KMRCL. Rail Analysis India : What are the TBMs Afcons is utilizing in the projects in India and What type of TBMs is Afcons using in tunneling for East-West Metro project ? Mr. Debasish Dey : In East-West Metro Project Afcons has used “Earth Pressure Balance” Tunnel Boring Machines of internal diameter of 5.55 meters. 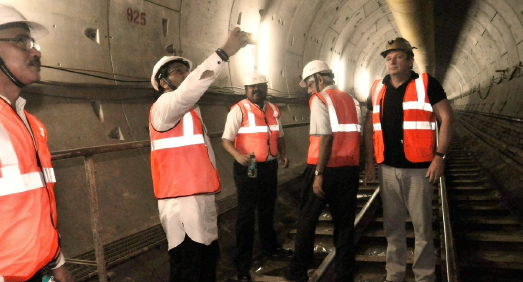 Rail Analysis India : What are the safety facilities provided in tunnels of East-West Metro ? Provisions of Cross-passages within 244.0 meters from any Fire Exit, where the distance between two Fire Exits is more than 762 meters. This is for the safe evacuation of the passengers from the incident tunnel to the non-incident tunnel. Rail Analysis India : According to you, once operational , what is the impact of East-West metro project on transport sector in Kolkata ? Mr. Debasish Dey : Kolkata, The City of Joy, is the pivotal point in terms of business and commerce and is considered to be the financial hub of eastern India. It is also a major major commercial & military port and the only city in eastern India to have an International Airport. Once India’s prime city, of late, the development has lagged far behind the needs of its growing population. The relative antiquity of Kolkata and unplanned mushroom growth of the city sprawls has further exacerbated the problems of the inadequate civic amenities in the city. Only 6.2% of the area of Kolkata is comprised of roads compared to 20%+ for other mega cities in India.With a vehicle population estimated to be around 1.6 million and 23.50 million transit trips a day in 2011, the city is at the verge of Traffic Bursting. The enormity of the problem can be easily figured out with very little scope to increase the road area in city and a projected vehicle population of 3 million and an estimated transit trips in 2025. It was realized early that only road transport would not be adequate to meet the growing transport needs of the population and rail based system for Mass Rapid Transit System (MRTS) is the most viable option to address this need. In 1949, the government conceived the idea of building an underground MRTS for Kolkata. The Master Plan for Kolkata prepared in 1971 envisaged a network of 97.50 km consisting of three North-South corridors of which three were selected for detailed planning. These three lines included Dumdum – Tollygunj, Bidhannagar – Ramrajatala and Dakhineswar – Thakurpukur. Based on the traffic survey, Dumdum – Tollygunj corridor was elected to be implemented and the work started on December, 1972. This corridor was extended to Garia as late as 2010. Bidhannagar – Ramrajatala corridor is the current East-West Metro Project. Once operational, the corridor shall have an immense impact on the Kolkata – Howrah transport sector . Connection of the Howrah & Sealdah Railway Station, which are amongst the most busiest Railway Stations in India.